It has been a loooonggg time since my last post. I guess one of the reasons is because I really hate taking photos and I feel like I can't post without pictures of my project/recipe/etc. In any case, I have been sewing quite a bit and even managed to make a couple of things that I can wear (about 2/3 of the things I make for myself never make past the sewing room trash can). 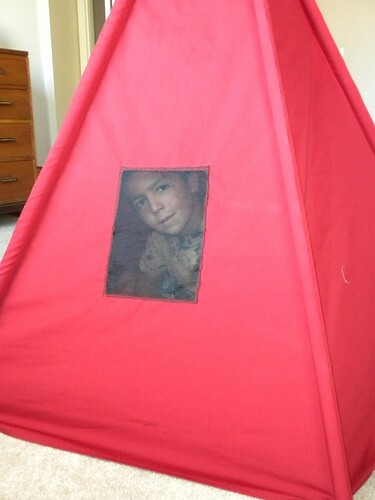 Today, I spent about 4 hours sewing this tent for our neighbor as a gift for his 6th birthday. The tutorial is great and I think it would have taken much less time if I hadn't added the trim, window and little pocket inside. 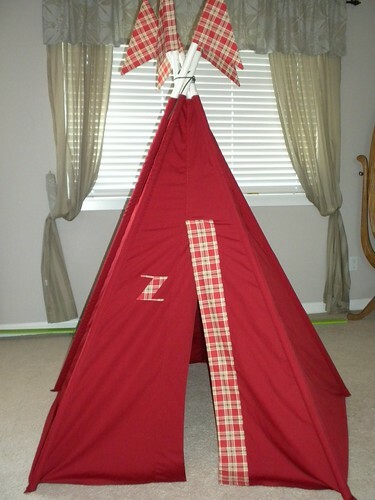 I think it is quite impressive and it cost a little over $7 in materials. Wow! 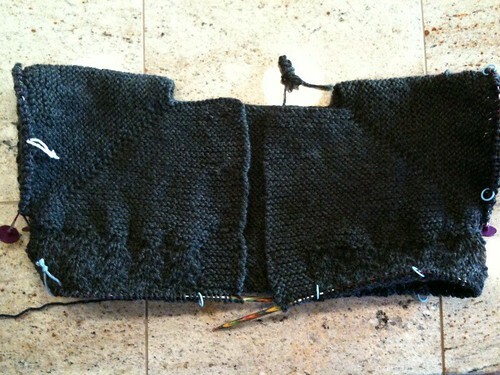 I finally separated the sleeves and started the gull-wing pattern on my long forgotten February Lady Sweater. Now I'm having fun! If I keep at it, it'll be done just in time for our 100 degree summer. Or maybe I can linger a bit longer and finish it by February 2011. That's a more likely scenario. Picked up an old knitting work-in-progess and..
More bread, mice, emergency repairs and scary pants. 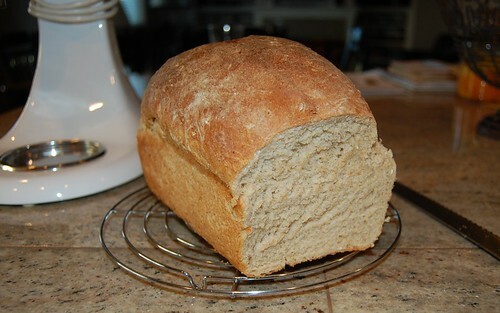 This is my third loaf of Alicia's Oatmeal bread. 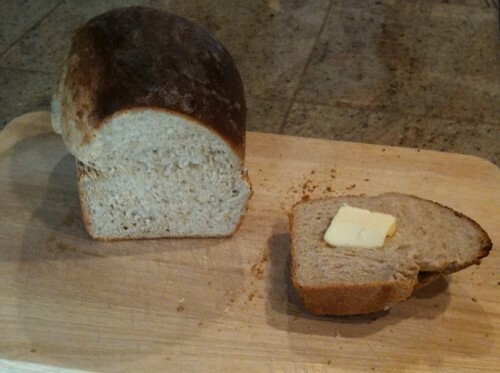 I enjoyed the last loaf for breakfast each day by toasting a couple of slices and smearing on some cream cheese. It was a comforting way to start off my crack-of-dawn workday. 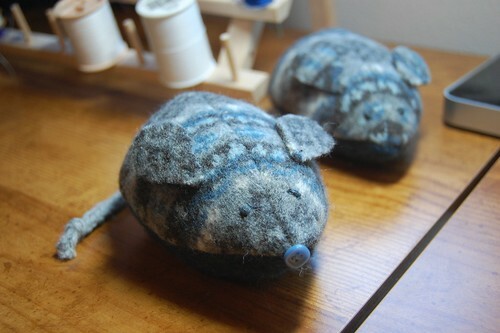 I had time to felt a couple of sweaters and make these mice (Betz White's mice were the inspiration). I haven't quite finished these. I tried to embroider a satin-stitch nose but failed twice. Then I sewed on the button you see here and I don't like it. So I ran to Michael's and bought some tiny pom-poms and I'm hoping those work out better. 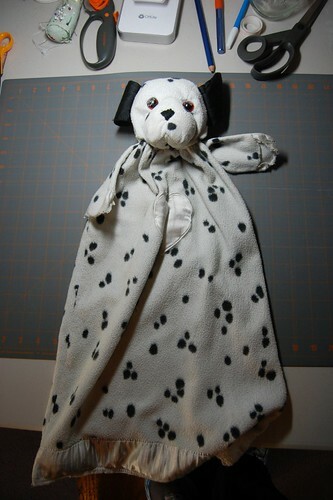 I had to do an emergency repair on TeeTee, my 6 year old's lovey. TeeTee's satin hands are rubbed through and the stuffing from his arms has fallen out but I think that part is beyond repair. Today his left eye fell off so I had to whip out the glue gun. I hope it holds! Finally, I took that vintage sheet I found two weeks ago and made these Don't get out of bed pants but they are so obnoxious and bright that I am embarassed to post a picture. I want to find a more feminine sheet with the lace detail like the original post because they were so easy to make and are really comfortable to wear. I didn't have honey so I used agave nectar but I'm thinking the honey will really bring out the whole wheat and oats. Also, it was way too liquidy when I had finished adding the yeast/sugar/honey mixture. I had to add about a 1/2 to 3/4 cup more flour which seemed to work perfectly. It's totally yummy - light and moist. Recipe here. 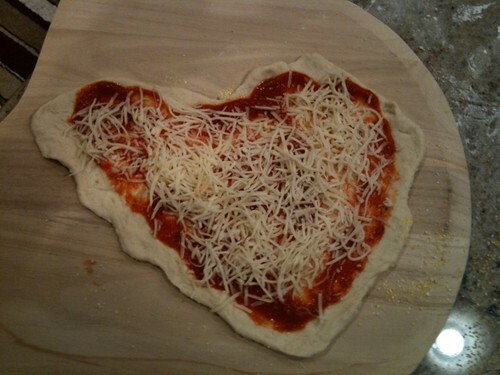 The heart shape of this pizza wasn't intentional. It's just that I can't make a round pizza to save my life. I don't know what my problem is but they always turn out oblong or wonky. 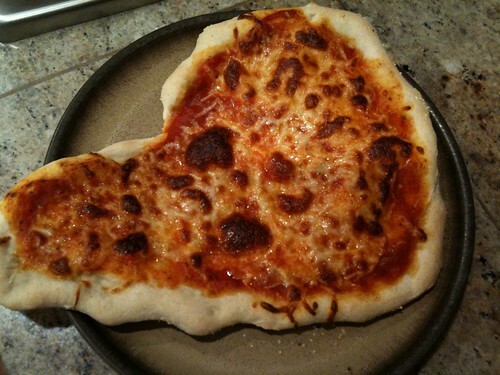 I used this Todd English pizza dough recipe from the Martha Stewart website. It was very easy to work with when stretching and had a good chewiness to it after it was cooked but there was no yeast flavor. I think letting it rise overnight in the fridge might help with that. I escaped for an hour today and hit Value Village again. They have their 50% off sale on Monday but I can't handle the crowds so I went today instead and paid full price. I found 5 cashmere sweaters, 4 wool sweaters and this funky vintage(?) twin sheet. 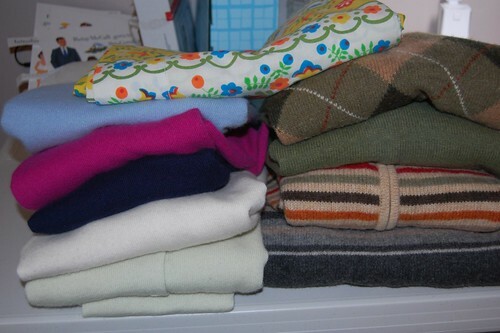 I am going to use the three green/red/beige toned wool sweaters to make pillow covers to use in our family room. The rest of the haul? I dunno. Into the stash for now! My friend's daughter turns three in a couple of weeks and when I saw this post with a set of magnetic paper dolls I knew I had to make Ellie some. Instead of magnetic sheets, I just printed the doll and clothing on cardstock and then laminated them between contact paper. I then put small velco squares on her tummy and on the backs of the clothing which worked out okay except for the fact that the dresses sit up off of her body due to the thickness of the velcro. Hopefully it won't matter to a 3 year old. 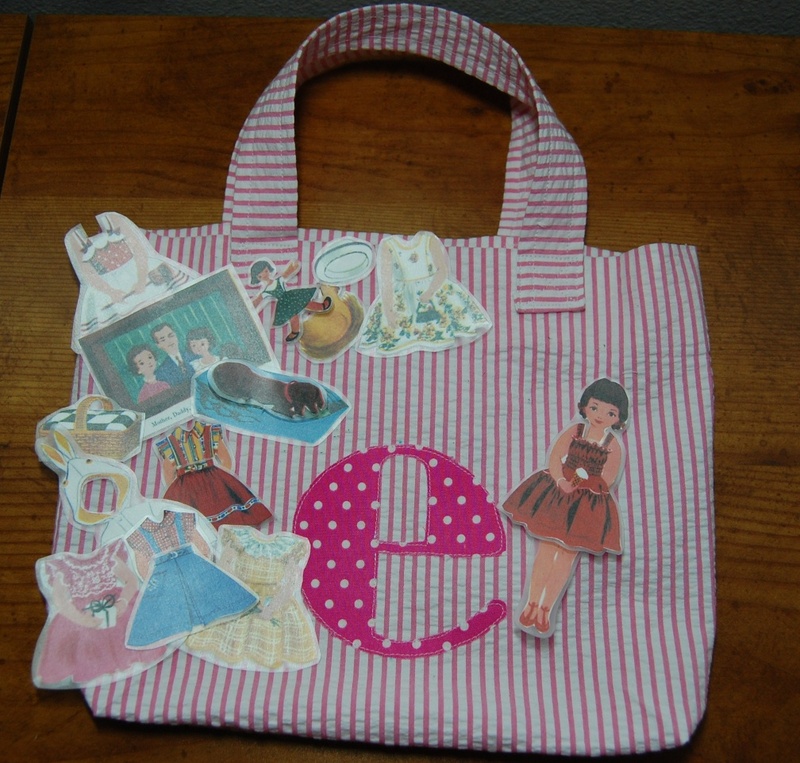 I made the little tote bag to hold all the pieces. The tote is made from a thrifted toddler dress that I've had lying around for years. Of course, when I was 99.5% done (only had to box the corners) I realized I had sewn the two sides together right-side to wrong-side. Because I had also serged the raw edges of the seams, I had to use my rotary cutter to cut off the edges so that I could rectify the error. Whoops!